The practice loses money everytime there is a patient no-show. Unused appointment times are wasted. Increase practice efficiency, increase bookings and revenue. Admin time reduced as patients now book appointments directly through the app. Practice has had success promoting seminars and special offers. Reduced appointment no shows with reminder alerts.Practice sends alerts to users when free time is available. Discount offer used to encourage adoption. As a professional golfer on the international circuit, Jarrod did not have an easy way to interact with fans or keep them abreast of his tournaments and results. Stay in touch with fans when travelling. Post updates which can be shared across all platforms at once. Donations platform allowing fans to buy merchandise from Jarrod’s Challenge Cancer charity. Social sharing – all social media in one place, with updates shared to all platforms simultaneously. Over 400 downloads in the first week of going live. Over 90% of users signing onto push alerts. 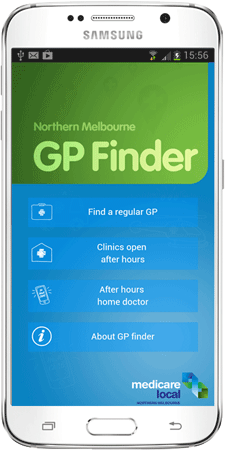 GP Finder, an after hours doctor service, needed a simple app to encourage people to visit local GP’s rather than attend hospital emergency departments. Create a simple app for app savvy people to find and book doctors day and night. Small regional estate agent with limited marketing budget. Increase awareness of agency, increase listings and sales. Position agency as an innovative leader in their field. Agency is now saving money through paperless marketing via the app. Now reaches out to more buyers and people looking to sell homes. More enquires due to the app. Dealership located in a small country town with a small local population of 6,500. Opportunities to attract new customers are limited. Ensuring app was simple to use and would be embraced by staff and customers alike. Reinforce customer loyalty and offer value to new and existing customers. Increase revenue through regular services and other offers. Incentivise customers to download and use the app. 4,500 downloads to date. 80% of users accepting push alerts. Dealership has experienced a marked increase in the number of service bookings. App is saving the dealership $45 for every sale enquiry by bypassing leading sales portal fees. App users rewarded with 3 year Roadside Assist Membership when purchsing a car through the app. Through live shows, talent competitions and TV specials, Cosentino has developed a fan base of over 160,000 people around the world. These fans interact with the Cosentino ‘brand’ on various social media platforms which is time consuming to manage. Streamline and increase regular communication to fans through one platform. Sell more tickets and merchandise. Increase fan engagement and promote upcoming live shows. 70% of users accepting alerts. Custom feature developed to allow for ‘Dancing with the Stars’ TV show fan voting. In app store for selling tickets to live shows and merchandise very successful. As a sport, UFC has a relatively small but growing following in Australia. Soa Palelei is an Australian mixed martial artist who wanted to grow his fan base in Australia. Fins cost effective way of promoting Soa’s upcoming events, sell merchandise to fans and promote sponsors’ products. Over 27,000 downloads to date. App has been very successful driving merchandise sales and subscriptions to televised fights. Regular engagement with fans through alerts for news and special offers. Sponsors’ products promoted through alerts. Australian and international fan base growing through the app. Small pizza/cafe with lots local competition. Staff spending too much time on the phone taking orders rather than serving customers and preparing food. Store had unique point of sale software that had to be integrated into the app. Increase sales and efficiency. Pass more orders through the app. AppsWiz was able to integrate the point of sale system into the app. Customers have embraced in-app ordering effectively reducing time on the phone. The local school for the deaf have taken to the app in a big way as standard phone order is often problematic. Due to the new app, the average order value has increased significantly and customers are ordering more frequently. A new coupon feature has also been successful in driving more sales. Savi Life is a small personal training and motivational program business. The owner, Shantelle Saiville wanted an app to help increase bookings and brand awareness. Drive engagement, easy delivery of motivational messages to followers, increase bookings, promote sponsors’ products. Savi Life app has proven to be a very cost effective way of growing business. Around 75% of users are accepting alerts. Social media integration saves time and is easy for fans to connect with. App needed to be integrated with existing health/prescription software systems. Had to be simple for all staff to use and update regularly. Pharmacy wanted to promote their catalogues and rewards program to new and existing customers. App seamlessly integrated with online prescriptions system. Excellent uptake of app with customers. Using alerts to promote catelogue sales. Building customer loyalty through increased brand exposure on mobile devices and app stores. Second Bite is a not for profit organisation with many volunteers to coordinate. The charity was looking for a better way to attract donations and communicate regularly with all stakeholders. App which delivered a cost-effective method of increasing donations and reduced administrative costs. The app has revolutionised the way supporters can make donations. Free push alerts helps for the charity to stay in touch with their many weekly volunteers. All social media in one place means more effective communication of Second Bite’s activities. A small osteopathic practice looking to reduce administration time spent dealing with bookings. Needed a cost effective and simple solution. Create an easy to use, self-service patient booking system that is integrated with their exisiting Cliniko management solution. Increased productivity by reducing time spent dealing with bookings. The easy to use booking system meant that the practice recieved more bookings. Practice use social media and alerts through the app to promote special offers.